Picture this...you're just starting your quest for information on your family. What you might not know is that there are many valuable free resources that can help you begin your search. I've listed several volunteer driven websites below that are dedicated to making family history resources free to everyone. I encourage you to use these tools and help out by becoming a volunteer! With the exponential growth of the internet over the past several years, and the dedication of these volunteer organizations, it's easier than ever to find information about your ancestors online. My advice is: start with what you know and work your way backwards -- that means start with your parents, aunts, uncles, grandparents, and then continue up the line. We are a group of volunteers working together and having fun providing free online genealogy help and information for every U.S. state and county. Each of our web sites (there are literally thousands!) are created and maintained by volunteers. The variation you'll see in site style and content shows the wonderful diversity of our volunteers! Some of the offerings you're likely to see in these sites include query/message boards, listings of local sources for records, county and state histories, online genealogy books, research tips, maps, family group sheets, photos, surname registries (where you can post the names that you're researching so others can find you - or so you can find them if they've submitted their names), transcribed court records, news articles, censuses and cemetery listings- and these are just a small example of the wealth of information available. You'll find all of the above and more online, accessible for free and from the comfort of your home. 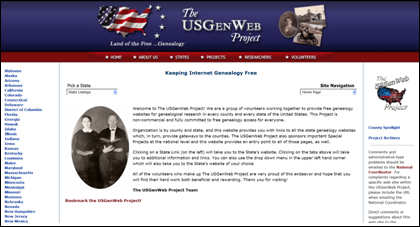 The USGenWeb Project was established in 1996 by a group of genealogists who shared a desire to create online centers for genealogical research. Patterned after the KYGenWeb Project which was originally organized in March/April of 1996 and called the Kentucky Comprehensive Genealogy Project, the USGenWeb Project now has web sites for each U.S. state and county. Some state sites also maintain their own Special Projects, which can include: unknown photos, vital records, African American records, statewide biographies, school pictures and yearbook photos (just to name a few). The USGenWeb Project Archives, also created in June 1996, is a major repository of actual transcriptions of public domain records. While the transcribed public domain records are presented in text format, some records such as original census images, bible records, or other rare or private records, are actually presented as images of the originals. Other Special Projects at the national level tied to the Archives include marriage, church and obituary records, military pensions, penny post cards, census images, digital maps, school and yearbook photos, photo collections, and historical publications. The Tombstone Transcription Project and the Tombstone Photo Project are two other Projects that are integrally connected to the USGenWeb Archives. These projects are dedicated to creating a lasting tribute to our ancestors through transcriptions of tombstone inscriptions and/or actual digital photographs of tombstones. Today, many tombstones, especially in older cemeteries, are suffering the ravages of time and weather. Many are becoming difficult to read, while still others have already become so faint as to be almost impossible to decipher. Besides tombstones that have been damaged by time, there are graves out there that will never be able to be identified because either the grave was never marked with a tombstone or the few people that might have been able to identify the location of the grave are no longer available to pass the information on to others. How many of you have ever seen graves in a cemetery marked by field stones? Someone, at some time in the past, knew who was buried in the graves marked by each of those stones! The Census Projects - Two of Them! There are two Census Projects that go by the name of "The USGenWeb Census Project", although neither one is an official USGenWeb Special Project. The first is at US-Census.org and the second is at USGWCensus.org. Both projects are dedicated to providing family historians with free online access to transcribed census records -- be sure to explore both. Random Acts of Genealogical Kindness (RAOGK) is a global volunteer organization with over 4,000 volunteers. These volunteers have agreed to perform a free genealogy research task at least once a month in their local area. Volunteers are listed based on the locale that they are willing to do lookups in, and the type of lookup they've committed to perform. RAOGK volunteers have agreed to donate their time for free, but you must pay the volunteers for his/her expenses for fulfilling your request (copies, printing fees, postage, parking fees, film, etc). The types of research assistance you might find are courthouse lookups, taking pictures of tombstones, lookups in vital records indexes or obituary lookups. Family Search, a part of the Family History Library of the Church of Jesus Christ of Latter Day Saints, has a ongoing volunteer indexing project. The indexing project spans the world, not just the United States. Records from their vast collection are converted to digital images by the Family History Library; volunteers from around the world can then download and transcribe at their convenience. The indexed records are then made available online for anyone with internet access here. Make sure to review the current list of indexing projects. My favorite response to this question is "Pay It Forward." Someone has shared the information on the above sites that hopefully helped in your research. You may have the one piece of the puzzle that someone else is searching frantically for. Volunteer to walk a cemetery and record the tombstone inscriptions and/or photograph the monuments and submit them to the Tombstone Projects. Submit photos of tombstones you have collected in your research, even if you don't have data on all of the burials in the cemetery. Host a USGenWeb Project site. Do lookups for the USGenWeb county/state sites, from books that you own or your own documented research or other records you have access to. Subscribe to mailing lists and/or message boards from the areas you're researching in and where you live and answer queries that you can. Share those old photos that you have in your collection that might mean the world to someone else that has never seen an image of that long ago ancestor. 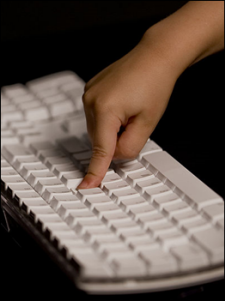 Transcribe primary source documents and submit them to the county site or to the USGenWeb Archives Project. Transcribe a census and submit it to one of the Census Projects and/or to the county site and/or the USGenWeb Archives Project. Abstract pertinent information from local obituaries and/or contact the local newspaper and request permission to transcribe obituaries and submit them to the county site and/or the USGenWeb Archives Project. Volunteer at your local library, genealogical or historical societies or family history centers. Register with RAOGK and help others with their research.